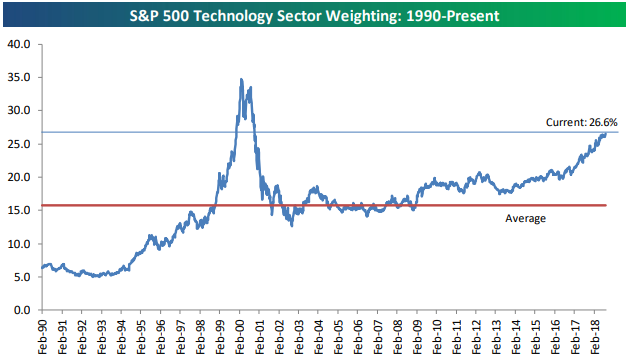 The tech sector now makes up 26 percent of the S&P 500 – its highest weighting since it peaked at just above 29 percent in the year 2000. Including Amazon, the industry is a bigger part of the index than it was at the internet bubble peak. S&P is creating a new communications sector to redistribute bulging tech companies. Past periods when the market carried an outsize bet for years on one segment — and index makers' went recasting benchmarks in response — have preceded tougher times. The entire stock market is bathed in the glow of Big Tech now, and some investors are beginning to squint against the glare. Information-technology stocks, as Standard & Poor's classifies them, have driven more than half the 8 percent gain in the S&P 500 index this year. Apple and Amazon have become the first $1 trillion market-capitalization companies in the U.S. And it's not just the giants: The equal-weighted S&P tech sector ETF is up a whopping 18.6 percent this year. The tech sector now makes up 26 percent of the S&P 500 — its highest weighting since it peaked at just above 29 percent in the year 2000. And if it also included consumer-discretionary bellwether Amazon — a software-and-data-driven company with a huge cloud-services division that most assuredly acts like a tech business and a tech stock — then tech would already be a larger chunk of the index than it was at the peak of the internet bubble in 2000. Whenever a sector has grown to be the largest, its performance over ensuing years has been disappointing. It happened at the last tech peak from 1999 to 2000, and when financials surpassed 18 percent of the S&P 500 in 2007. New sector a bad sign? So tilted is the ship of stocks toward tech that the index keepers at Standard & Poor's are about to rearrange the deck chairs to make it seem more balanced. A new communication services sector is being created to capture the old telecom group as well as Old Media and digital-media names including Alphabet, Facebook and Netflix. Just being the largest category of stocks in the market doesn't in itself mean the market has already overdone it and set the group up for failure. The line between big and too big is invisible — and probably always moving depending on changing circumstances. The elemental underpinnings of tech leadership are clear: Software is indeed overtaking all of business and daily life. Today's economy, with networks connecting billions of web-enabled devices, produces enormously profitable winner-take-most companies with massive economies of scale and towering profit margins. Then there's the fact that — to repeat a corporate-speak cliche — virtually all companies are in some way tech companies today. (In the 1920s bull market, did CEOs and analysts go around saying, "When it comes down to it, all companies are electricity companies now"?) So perhaps citing the dominance of what we classify as tech offers a skewed picture. The danger comes when paying up for the anointed winners in tech at ever-higher valuations seems the inevitable choice of too many investors. So many distinct investment strategies are roads to a heavy tech allocation. And the money is flowing there in torrents. Only want companies with rapid revenue growth? Tech. How about "quality" names with strong balance sheets and hefty cash generation? Same answer. Looking for stocks with global exposure that aren't tightly tied to overall economic growth rates? Can we interest you in Alphabet, perhaps? 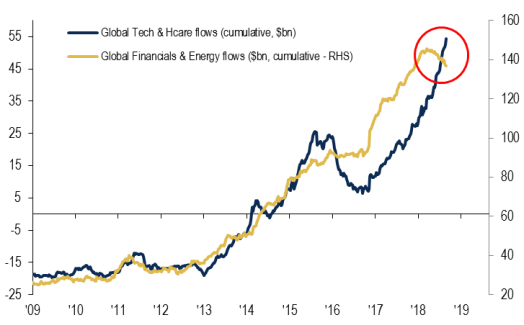 RBC Capital Markets U.S. equity strategist Lori Calvasina has been among the relative few skeptics on tech's continued leadership this year. Her reasoning: The sector "continues to look extremely crowded" based on a post year-2000 high in net bullish analyst ratings, valuations recently registered an 18-year relative peak and flows into tech ETFs appear to have peaked a few months ago. Strategists at Bespoke Investment Group flag the eventual risk in all this without anticipating a reversal soon: "We continue to be concerned about the tech sector's heavy weight, which will eventually be a big area of pain during the next bear market. But until we start to see signs of a breakdown, the smart play is to stay long and strong." That stance has been the right one for years, even as predictions of "peak Silicon Valley" spread, warnings flared over trillion-dollar market caps and Congress grills tech leaders on the societal damage blamed on their creations. But for how much longer?